Anyone who has visited the Old Stone House over the past few months has seen, in various stages, the largest restoration project undertaken by the RHA since its founding more than 50 years ago. The May Barn in its original location and condition on South Central Ave. in Ramsey. Despite the poor condition and questions about how to move the structure from its South Central Ave. location, the RHA moved ahead. “It had to be saved” recalls Ron Kase, RHA’s VP of Development, “It’s what we’re all about”. The project began in earnest this summer when the RHA contracted a company that specializes in post and beam barns to dismantle and move the structure. The RHA would like to thank Mayor Botta, the Town Council, and Nick Saros for their support which included the cost of a new foundation adjacent to the Old Stone House. We’d also like to thank Peter Montalbano who made a generous donation to get the project going as well as RHA member Carolyn Semento who sent in a donation after seeing a feature article on the project in the Suburban News. Once the beams were dismantled they were reassembled next to the Old Stone House. 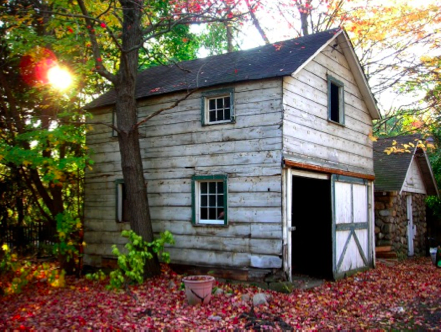 By October a new cedar shingle roof was in place, any remaining damage to the beams had been repaired and the barn was ready for siding. Volunteers on the project include Andy Clark and his dad Jim, Fred Swartz, Paul Simpson, Tom Branna, Dave Delisi, Jim Palumbo, Kurt Pralle, Tom Latchford, and Mike Heffernan. 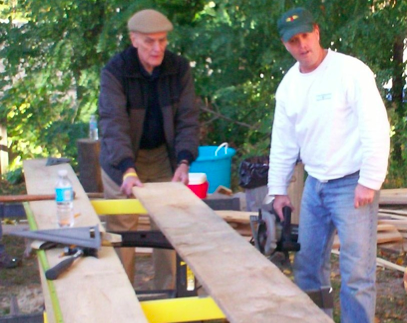 Andy Clark (right) with his dad Jim Clark working on one of the 1×12” rough-cut hemlock boards used to restore the original “board and batten” siding for the barn. 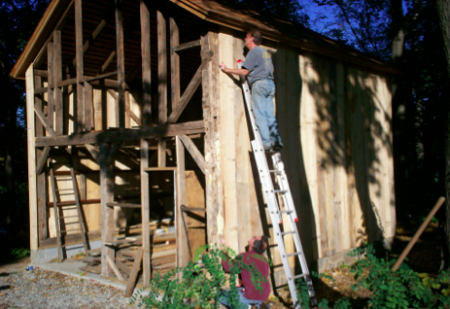 The restoration work will continue into the spring and summer of 2009 including fabrication of doors and shuttered windows, flooring and stairs for the hayloft, and restoration of the original horse stall. Long time RHA member Kurt Shuart is working on a display that will include antique horse grooming equipment and a 19th century horse trough. Volunteers Andy Clark (on ladder) and Fred Swartz work on the May Barn restoration in October.